Revolutionary new way of creating rich content in Drupal. In terms of concept Bricks is a new generation of Paragraphs, an alternative to Panelizer and a good friend to ECK, Inline Entity Form and your favorite WYSIWYG. Shortly, it allows you to nest Entity Reference field items using Drupal drag & drop UI (exactly like for menu or taxonomy items). NEW As of 8.x-1.6 Bricks supports Layout API! ↳ It’s recommended to migrate from Bricks Bootstrap to Bootstrap Kit (but not required). Click Launch sandbox and wait. Follow the installation (all settings should be pre-filled, don’t change them). Go to Extend and enable Bootstrap Kit Demo. Go to Appearance and set Tweme as default theme. Find an auto-created node and go to Edit mode to check magic out! Finally go to Content and create your own first Bricky page! Like it? => Support by ★ starring on Drupal.org, ★ starring on GitHub and/or sharing on Twitter. Follow the instructions above, but using the different sandbox link. Then follow the Paragraphs setup instructions. Install Bricks Default (shipped with Bricks) and its dependencies. Done! Now you can create Bricky pages (content type) using simple pre-configured ECK bricks like Text, Image, Wrapper and special Layout brick (which can render other bricks via Layout API). Use an auto-created node as a live playground. Additionally install Bootstrap Kit and its dependencies. Done! Now you can use Columns, Accordion, Carousel and Tabs components via Layout brick. Install Bootstrap Kit Demo (shipped with Bootstrap Kit) to get a sample node. Additionally install Paragraphs Demo (shipped with Paragraphs) and its dependencies. Also install Bricks Revisions (shipped with Bricks) to be able to reference revisionable entities like Paragraphs. Go to Structure > Content types > Paragraphed article > Manage fields. Go to Manage form display and set Bricks tree (Inline entity form) widget for Paragraphs field. Go to Structure > Paragraphs types and create Layout type. Done! Now you can create Paragraphed pages (content type) using default Paragraphs as bricks: Text, Images, Image + Text, User and special Layout brick (which can render other bricks via Layout API). All new Bricks for D8 has no requirements and works with ANY entity types! 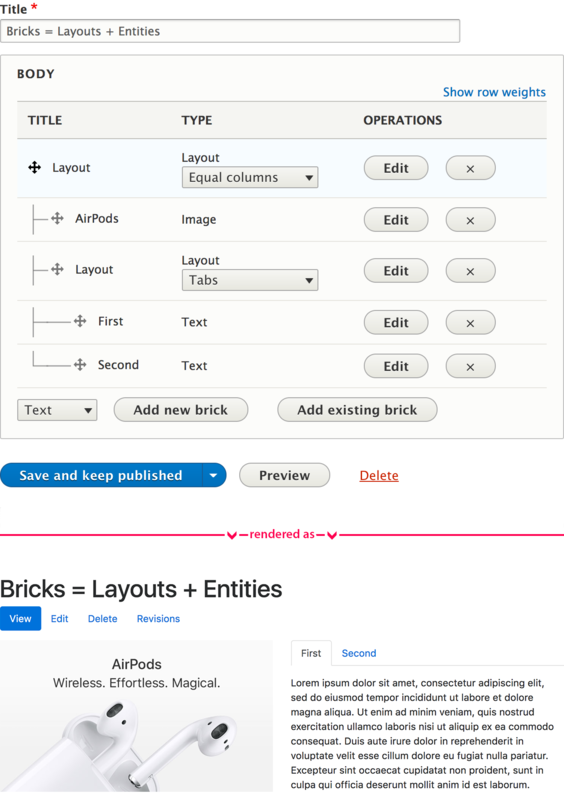 Bricks Core gives you a Bricks field/widget/formatter pack allowing you to compose flexible content of bricks (Layouts and Entities) via draggable tree UI. Bricks Inline 8.x-1.1+ allows you to create and edit bricks right in the draggable tree via Inline Entity Form. Bricks Revisions 8.x-1.3+ integrates Bricks with Entity Reference Revisions. ECK: Structure > ECK > Bundle list > Add bundle. Paragraphs: Structure > Paragraphs > Add type. Don’t forget to allow this bundle in your Bricks field settings! Project pages: uibricks.com • drupal.org/project/bricks. Video tutorial: vimeo.com/211714437 by Hans Riemenschneider. Tutorial: drupal8.support/en/modules/bricks by Dirk Bernaert. tehn.ca & mghf.ca by Digital Echidna — for both sites, the home pages are entirely built with bricks, no blocks. What is a difference with Layout Builder? 1. Layout Builder (LB) is designed to control any ENTITY layout (per view mode, or per entity). 2. Bricks is designed to control entity reference FIELD layout (per entity per field). Layout Builder and Bricks follow different goals and have different approaches as a result. They work well together and one could not replace other one. IE: You can create Article ENTITY and create Content FIELD on it. then you can control whole entity layout via LB and Content field layout via Bricks. the whole Content field rendered by Bricks will be available then for LB as a block. 100% translatable (thanks Entity Translation and ECK). Just mark them as translatable at /admin/config/regional/content-language. Which entity types are supported? Bricks can hold references to any entities - ECK or Paragraphs, doesn’t matter. And Bricks Bootstrap is just an example of using ECK. Does bricks support revisions of the parent entity? Internally Bricks field is a multi-value Entity Reference field => standard revisioning mechanism works. Moreover, Bricks Revisions (core submodule) allows you to revision referenced entities. Is there a reason why i can not just use bricks form widget for the normal paragraphs field? Paragraphs couldn’t be nested using drag and drop! Bricks field allows you to do (like on gif). How to get non-equal column layout, 4-8 in example? Proudly made by Anton Staroverov.